Ford and Volkswagen are in early talks about jointly developing a range of commercial vehicles. The two car giants said they were "exploring a strategic alliance" aimed at strengthening both companies' competitiveness without giving details. However, the cooperation would not involve any share swaps or cross-ownership deals. Ford's biggest-selling commercial vehicles are the Transit van and the F-series pick-up truck. VW also owns the Scania and Man truck brands. Car companies are increasingly collaborating to cut the costs of developing new technology amid a growing demand for more environmentally friendly vehicles. Earlier this year VW struck a commercial vehicle alliance with Toyota's truck division, Hino. At the time the firms said areas of cooperation could include hybrid and electric engines, as well as connectivity and autonomous driving systems. 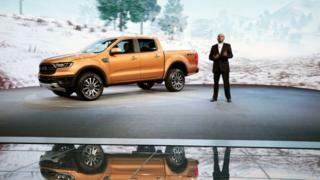 At the Detroit car show in January Ford unveiled a more fuel-efficient version of its Ranger pick-up truck. Meanwhile, Ford plans to renovate the famous Michigan Central Station in Detroit - a historic and eye-catching railway station that opened in 1914 before closing in 1988 and having its interior subsequently vandalised. The company will turn the building into offices for up to 5,000 technology workers and software engineers working on self-driving cars. "We have big plans for this building," the carmaker's executive chairman Bill Ford told an audience outside the 18 storey landmark, built in the Beaux-Arts Classical style. Ford has not revealed the cost of the renovation, but said it would be completed using some of the cash previously put aside for a revamp of its headquarters in the Detroit suburb of Dearborn. That project has a budget of $1.2bn (£900m). The carmaker will receive unspecified tax breaks from Detroit and the state of Michigan towards the project.